It’s really exciting when class promises something completely new and so it is for lesson 16: Mousseline de snapper et crevettes rose, sauce Nantua. This is not something you would cook for a week night tea. We pipe the mousseline mixture of snapper and prawns, egg white and cream into cute little round moulds and they are placed in a bain marie until just warmed through. 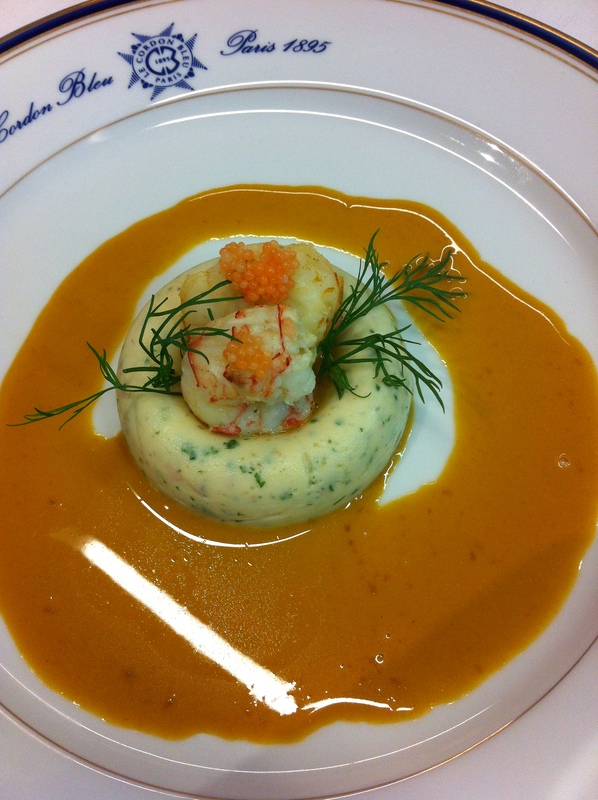 You will see in Chef’s dish below that there’s a piece of crayfish and langoustine nestled in the middle of the mould. I’m getting much better at dealing with creepy looking creatures which is just as well as the Sauce Nantua with it is made by sauteeing the head and shells of langoustines. I whip off the heads in no time, and break away all the hard shell and the lot, eyes and everything goes into the pot to brown along with some finely diced veges. It’s flambed with cognac before fish stock is added and reduced. Then the whole pot full is poured into a blender and after a few minutes of a deafening crunch, a liquid emerges. We strain it and it goes back in the pot to reheat before cream and butter are added. This is a seriously intense sauce. 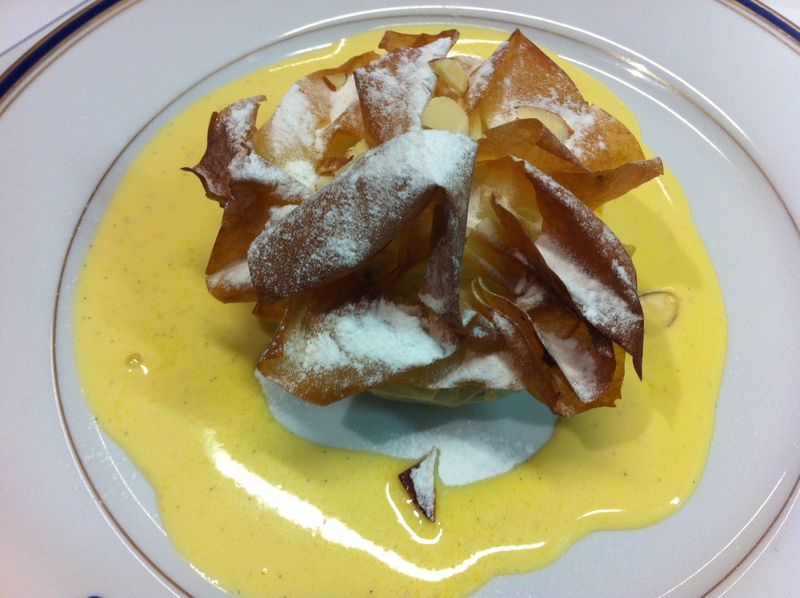 The dessert is pommes en pate with more creme anglaise. What makes this really special and stand out from the normal apple strudel type dish I have made in the past is the caramelisation of the apples. Lots of butter of course on a strong heat and then raisins,walnuts, sugar and cinnamon are added. The filo pastry is hellish hard to work with in the dry heat of the kitchen. It just means we have to work really fast to get it buttered and into the small trays in record time. A sprinkling of flaked almonds and a dusting of icing sugar and dessert is done. In between all the other tasks, we have made ricotta cheese in preparation for a dessert for lesson 17. I’m surprised how easy it is but lets see how it drains overnight before I get too cocky. It looks beautiful and no doubt taste devine as well. So love reading your blogs. You make it sound like child’s play! 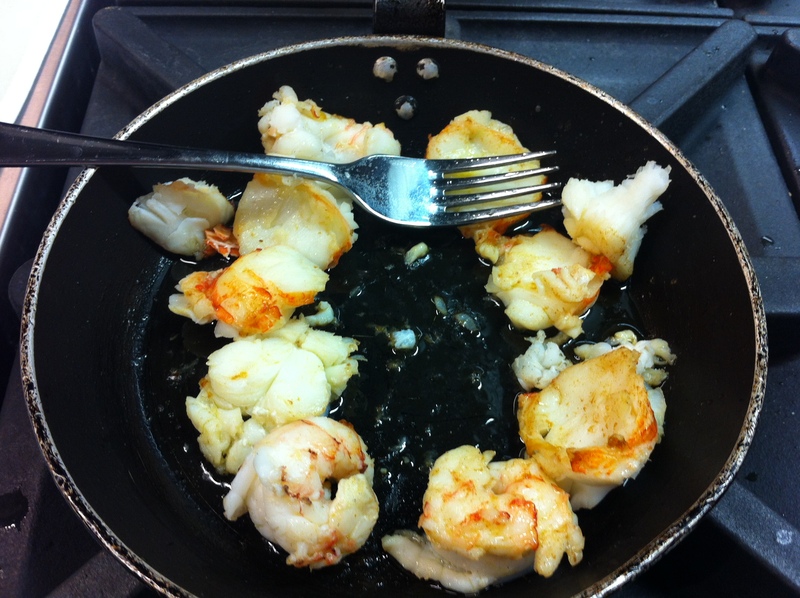 Would love to be eating these, not so sure about the immaculate art of cooking them though – your LCB experience continues to show me that my style of cooking is definitely domestique! Probably peasant at that. I think I got stuck at Elizabeth David, and that’s not at all bad.